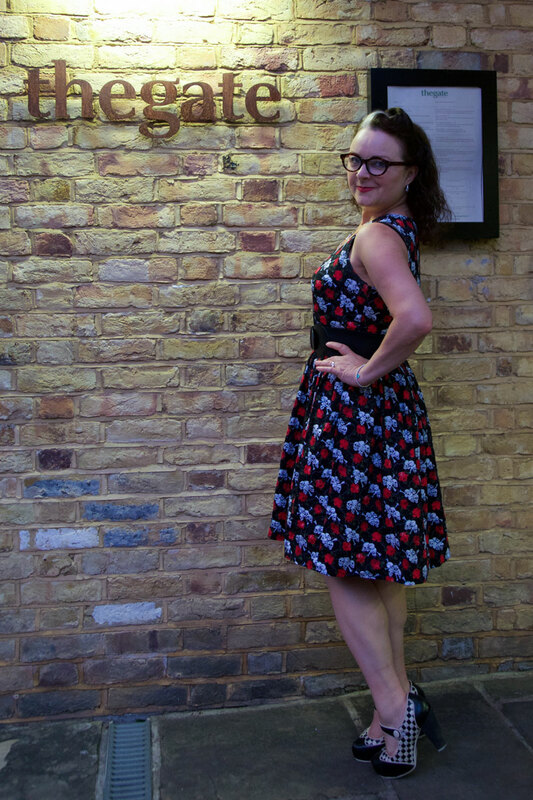 This dress is round three of my strive to perfect a self-drafted bodice pattern. 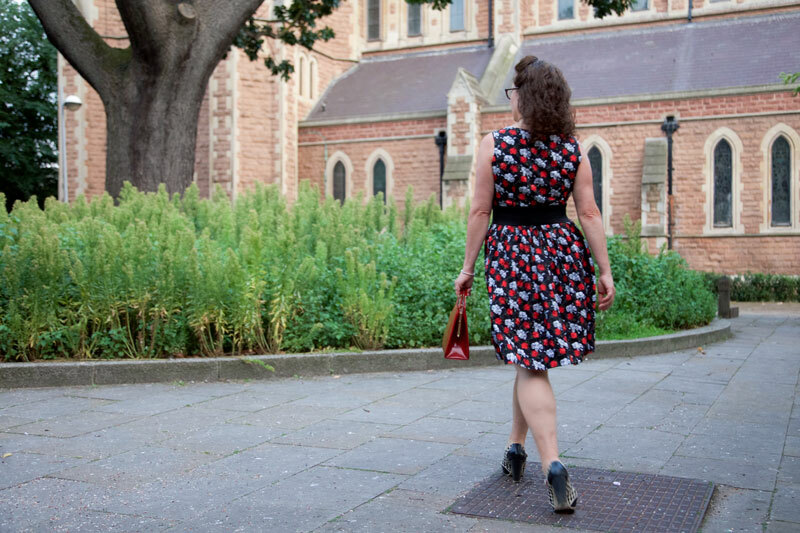 It follows on from a self-drafted retro top, blogged in 2014 and my recent wax cotton print dress. There’s something wholly satisfying about returning so soon to a pattern that you know will work. And I’m sure it will be even better to come back to following a few more tweaks. The neckline on the wax cotton dress gaped just a little so I fixed that and refined the curve of the neckline too. There was also some gaping at the back bodice armholes, so I took out some excess and transferred it to the back waist darts. The skirt on this one is a simple gathered dirndl. Easy to make, easy to wear, easy to dance in. And also a little less of a Marilyn fashion risk than a circle skirt on a blustery day. The invisible zip is set on the left side of the bodice as before, but this time I remembered to keep the back piece as one, so the pattern isn’t split. And plus, I’m rather digging the burrito method of self-lining. Have you tried this yet? I’m chuffed that this was another piece of fabric that emerged from from the bottom of stash mountain. I’m sure Dan had his eye on this for a shirt at some point but I think he forgot. And I shamelessly neglected to remind him! The colour scheme is my favourite kind and I love a little nod to rockabilly. 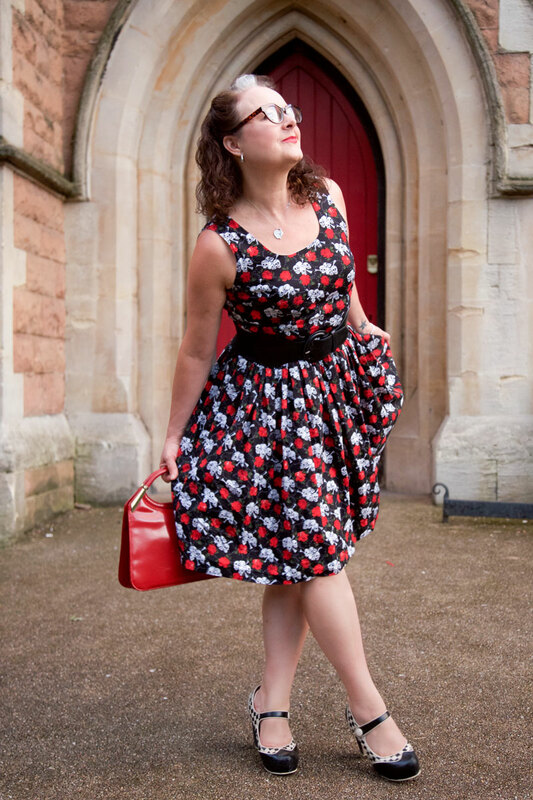 This dress has been worn and snapped to death already with no time to blog until now. It’s been my go-to for all number of events – clubs, festivals, gigs and even the office. I’ve got to put it to the back of the wardrobe for a bit now, though, because I’m sure I’ve clocked the look that says: “Someone didn’t make it home last night!” 😮 I did. Obvs! Daniel took these photos for me, on our date night last night. Multitasking. Always! I’m standing in front of St Paul’s church in Hammersmith. Such a beautiful grade II listed building among all the modern architecture and the hustle and bustle over and under the flyover at the broadway. It’s been a place of worship since the 1600s! So much history on a little patch of green. Light was fading and our tummies were rumbling as we snapped these in a hurry en route to The Gate – one of my favourite veggie restaurants. Dan agreed that there was no lack of meat on the plate. My only regret was that I didn’t have enough room for desert. They looked so awesome! Perhaps my next dress version ought to be of expandable material!